I think most of you are very familiar with the selfish seamstress and the concept of dont-sew-for-others. And if you haven’t figured it out, I am a selfish seamstress as well. Besides a few bags for my mom, ties for my dad and hubby, a T shirt for a friend, a laptop cover for my hubby, and a half assed attempt at a ninja uniform for him, I havent sewn for other people at all. And that is not because people have never asked me to sew stuff for them. I got plenty of that coming to me, but I always say no as nicely as I could. I had always been that way since I started sewing. My grandparents visited us back when I was into soft toy sewing, and they wanted me to sew a teddy bear for my baby cousin that I had never seen. What did I say? NO! I did not see the point of sewing for a cousin who is too young to appreciate it. And most importantly, I did not like sewing under requests. I dont think I was selfish, I had given all the softtoys I sewn to all my friends and teachers as a token of remembrance when I left Singapore, leaving myself only Mr Towel. And that was not because we had no room in the luggage, we had free moving service that moved all our furniture from Singapore to the US. Thinking back, my grandparents probably just wanted a bear so they can show off to their friends and family back in China how talented I was. I guess they could have just told me that and I would have given them a toy I already made, because THAT is a valid reason (and did i tell you? I love attention)! Now that I started sewing clothing, I am even more unwilling to sew for others, especially when I am asked to do so. All the stuff I had sewn for others? They are all surprise presents. None of them are “ordered to go” . Even my own poor mother, had bought some fabric a few years back, and wanted a long length skirt. Truthfully, If I sewed for anyone, it would be for her and my dad (though, men’s clothing is so intimidating! ), but that fabric was polyester! I had already became a snobby seamstress by then and i detested polyester. So it sat on my shelf for a while. Then she cut it up and relieved me of the task I hated most. It sat on my shelf for a little while more. Now she had given up all hope for that skirt, as I had told her honestly — that fabric gives me no motivation. Yes, MY OWN MOTHER had to suffer with my selfish seamstressing. You may be wondering, why is Juebejue ranting on and on about this? Well, Juebejue just got suckered into sewing for someone at their request!! *GASP* *OMG* *the world is ending*! Every year at my work, my coworkers organizes a paddle for life team to raise $ for the cancer association. We raise money as a team, and race other teams across a body of water. And of course, being close to the drummer (she sits right next to me) and the organizers, and being the pro seamstress in their eyes, they all looked to me. DARN! And then they wrote me an email and asked that IF I have time, MAYBE I can sew a hat for them. DARN. It is kind of hard to turn down a team of charitable people with a charity that I was involved in, and no less, with a cute request like that. 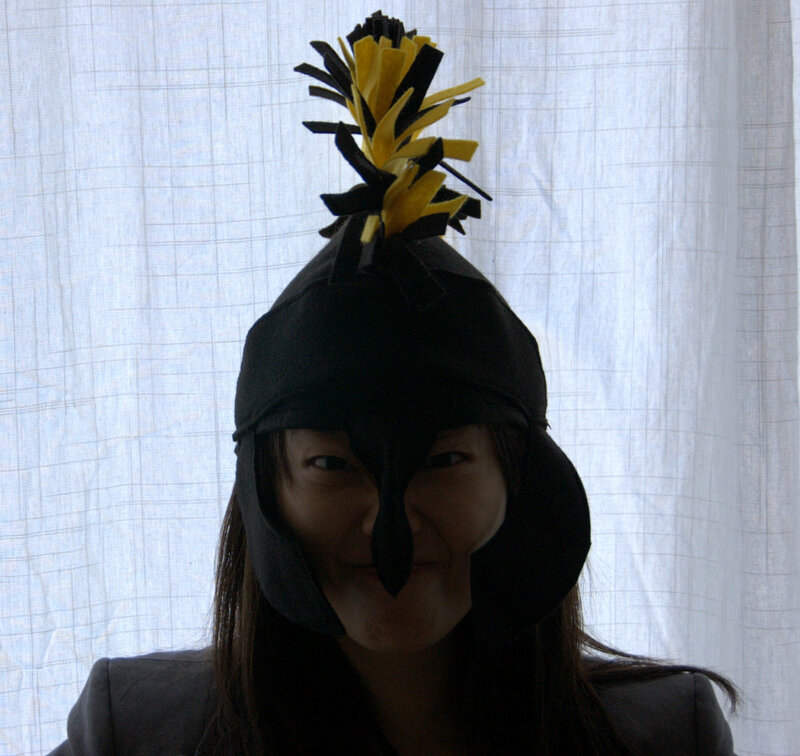 This entry was posted on Sunday, August 22nd, 2010 at 10:49 pm	and posted in finished pieces, sewing. You can follow any responses to this entry through the RSS 2.0 feed. haha that’s soo cute! i know the team, my co-worker was a member!! as to the selfish seamstress topic, although i sew for a people, i only do it if i get paid, except for some exceptions – family or very close friends. and i HATE when people ask me to alter things! altering things takes much more than making things! people don’t understand how much effort it goes in to it, from ripping the seams to putting new zippers etc. anyway, so in some sense, i am a selfish seamstress as well. So cute!! It wasn’t totally selfish because you are part of the team so it was for you too! At least, that is one way to look at it. lol! silly ngoc! wear it more! we will be making lots more in the future and you are gonna like them even more! omg! do you work for xilinx? what small small world. yes i do! are you also a xilinx person?? Anyways, good to see another geek girl who loves sewing. You make cute stuff and your hubby takes great pictures. Keep it up! I totally understand being a selfish seamstress – I am one myself! Sewing clothing just takes too much time to say yes to every request that comes my way (though I did agree to sew a simple Halloween costume for an acquaintance who is paying me). I even lost a friend because of my selfish seamstress ways. She asked me make her a fully boned corset, which takes me about 8 to 10 hours plus custom pattern drafting for $60. The supplies alone would be half of that price! I told her I would help her draft a pattern and guide her through making her own, to which she replied “I thought we were friends” and then she stopped talking to me. Pretty juvenile, and not what you’d expect from someone you’ve only known for about 4 months! Like you, only my close family would be able to get that kind of labor out of me :D.